Micro CPA360 drilling attachments can easily been installed on mini excavators and backhoe loaders and can drill holes in 360 degrees of rotation, offering lot of new job opportunities including, anchoring, rock splitting, drain holes and earth rod installation to name a few, but maintaining the core excavator usage of loading, trenching and demolishing. The combination of the micro CPA and a small size excavator makes it much better adapted to the work in urban areas, in small construction sites or those with difficult access than a conventional machine, bigger and difficult to transport. 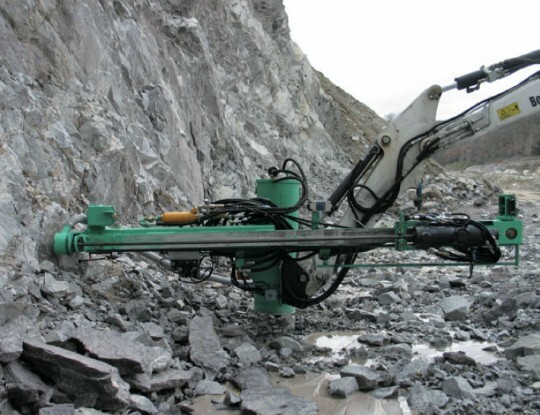 Can be quickly removed, making the machine available for digging or loading without limitation, thus, avoiding the use of different specialized machines making the site organization easiest. The micro CPA can also been used for special application. Thanks to its light weight design, it has made possible, for some companies specialized in land reinforcement, to adapt the drill mast on machines with telescopic or extra long reach booms.